We have had a 97% success rate in finding business finance for companies. 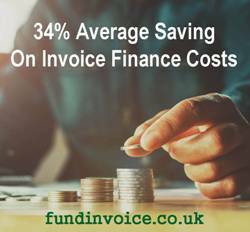 We have found average cost savings of 34% for our invoice finance clients. We have an average customer rating, at the time of writing of 4.9 stars out of 5. We were Finalists 2018 for Best Invoice Finance Broker at the Business Moneyfacts Awards. Need Help With Business Funding Or Invoice Finance? For help and advice about finding business funding or invoice finance please call Sean on 03330 113622.